It has been said that the difference between true love and madness is very small and the boundaries between the two are blurry. Indeed the one who loves much is likely to do things that resemble in the eyes of others, especially those who have learned to examine everything with cold logic, as overly mad. Some of these things may as well be, but everything that is not compatible with our logic is not necessarily irrational. It may be entirely logical or super logical, such as, for example, the lives of the saints. Whatever Saint Alexios did in his life is impossible to explain with the logic of accommodation and welfare. He left his wealthy parents, family and friends and spent his entire life across from his family home, in a hut, poor and unrecognized by everyone, despised by his slaves and servants. Yet the madness of the saints is not irrational, which is the big difference, but it is a rational madness, namely courage and spiritual bravery. God is eros, "Thou art eros" (Anavathmoi, plagal of the first tone), Who intoxicates all those who taste of Him, "Thy cup intoxicates me like the best [wine]" (Psalm 22/23:5), but this is a sober drunkenness. Once an ascetic hermit of Mount Athos, was asked the following question by a pilgrim: "What is it that makes you sit alone for so many years in a cell in the wilderness?" He responded: "It is like wine that sweetens you and makes you drunk and you do not want to leave for anything." To the request of this visitor that he be given a little taste of this wine, the Elder told him with a smile: "You will get drunk and your wife will be looking for you." 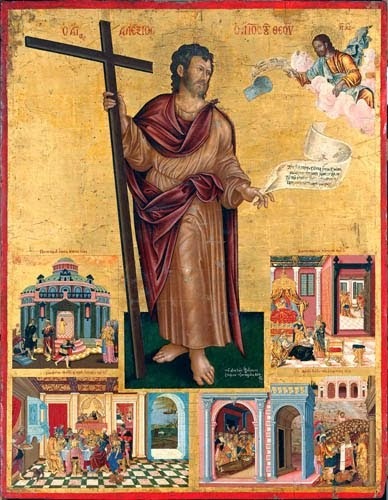 The venerable Alexios, truly a man of God, as the Church calls him, had all the requirements to live a "successful" life. He came from a wealthy family, was an only child and a young man. He had his whole life in front of him, as we are wont to say. Yet it showed he was not satisfied by all of this. He searched for something else to fill his inner world. It was that thing that made the Apostle Paul consider all things as rubbish and trash, that thing that pulled at him so much, that he came to the point of saying: "I desire to depart and be with Christ" (Philip. 1:23). The Saint went to various shrines and finally thought to go back to his place completely changed, so that he would not even be recognized by his parents. He set himself up, as we mentioned above, in a hut across from his rich family home, and there he lived all his years poor and despised. His former servants who respected him and bowed before him, now mocked him and considered him a poor foreigner. The spiritual level of a person, and people in general, is generally associated with their behavior towards simple people who do not have money or offices, and by their hospitality, that is, their behavior towards foreigners. Spiritually cultivated people have developed a sense of hospitality. We know from the Old Testament that Abraham was saved and became a type of the saved, because he was a lover of God and a lover of strangers. I would even say that true Christians do not make a distinction between a foreigner and a non-foreigner, since they know that here on earth we are all strangers and foreigners. Our true homeland is the "Jerusalem above". For Christians "every foreign place is their homeland, and every homeland is foreign" (Epistle to Diognetus). Obviously the slaves and servants would be crass and the Saint suffered badly, but he was greatly patient. Besides, without patience life cannot be endured. The Fathers call patience "a garment wet with the tears of the ascetics", or those who try to align their lives with the Gospel. The life of the venerable Alexios was a peaceful revolution against the establishment of accommodation and welfare. It is a nuclear bomb that crushes self-sufficiency, dignity and respectability. It is a rational madness "that heals our irrational madness". Source: Ekklesiastiki Paremvasi, "ΟΣΙΟΣ ΑΛΕΞΙΟΣ Ο ΑΝΘΡΩΠΟΣ ΤΟΥ ΘΕΟΥ", March 1997. Translated by John Sanidopoulos.